Straits Times journalist from Singapore, Lim Yee Hung reported in a newspaper article that he received two university degrees last week. One is an associate degree in Criminal Justice and the other is a bachelor’s degree in Journalism. It took him just one week to get both degrees. If university degrees are that easy to get, they are probably fake degrees. He called Belford University’s hotline before buying the degrees and was assured that Belford University degrees are perfectly legal, properly accredited and accepted all over the world. In order for an applicant to qualify for a Belford online degree, the candidate must have sufficient ‘life experience’ or an ‘online equivalency test’ which can be done under one hour. When Lim received The Belford University degree, he found that it was very impressive. Along with the degree package were also educational transcripts with grades for each module. The university seal is embossed on the degree and looks authentic. How could there be grades and transcripts if tests and examinations are not taken? 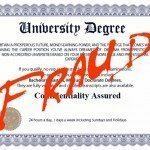 So if you want to get an online degree, then it is prudent for you to do a thorough due diligence and check with your local educational authorities for the online university’s authenticity so that you will not end up with a fake degree by a costly mistake.